On a blazing hot Sunday several weeks ago, I visited one of the most amazing spots in Central Oregon, a state park called Smith Rock State Park. It’s a haven for rock climbers, as tall cliff faces shoot into the air at steep angles and varying sizes. For hikers like me, it’s a spot of sagebrush steppe with meandering trails and an array of plants and critters that can keep one occupied all day. It was a beautiful day in the rocks and always an education: as I sat on a sun-baked rock enjoying my lunch, I glanced down to see that I had chosen a spot which ants had chosen long before me. I’d disturbed their home, and they were haphazardly scurrying across both of my feet and up my legs. I leapt into the air, squawking and dancing and stomping like a madwoman. It’s a shame I don’t have it on video. After apologizing profusely for killing several of their tribesmen in my surprise and panic, I offered them a hunk of my lunch. They examined it and, after deeming it unworthy, returned to their subterranean home. Apparently ants don’t care for fried fish. One of my favorite things about dogs is that they are happy to visit just about anywhere – desert, beach, forest, whatever. They are eternally up for adventure. The beautiful carvings of beetles. I have decided that the doggie backpack is an essential item for the owner of high-energy dogs. A few hot hours carrying his own water around and he’ll sleep for the rest of the day. Smith Rock’s craggy peaks and thirsty slopes. The sun shines through waxy Oregon Grape leaves and the air is thick with the perfume of the plant’s tiny yellow flowers. Drunk on nectar, bees float heavily from bush to bush. 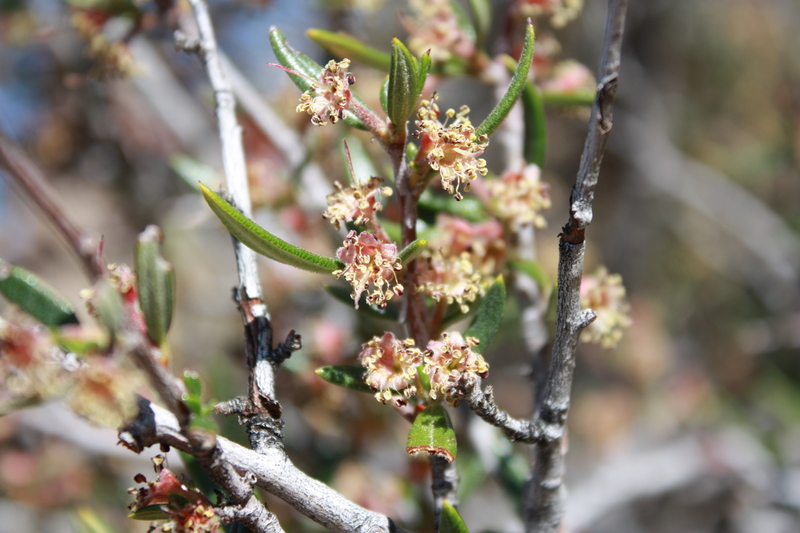 This is the first time I’ve gotten to see Curl Leaf Mountain Mahogany in bloom in person! The flowers are utterly tiny and easy to miss, but upon close inspection they’re actually quite beautiful and fragrant. This is a tree of serious drought tolerance, a very cool species. Another shot of the Mountain Mahogany.